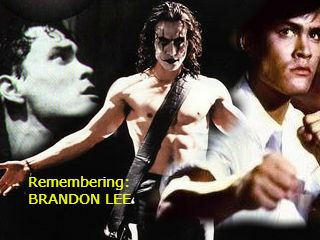 Brandon Lee remembered today 25 years after his passing in a fatal gunshot wound on set of the crow on 31st march 1993. A flame that was distinguished to soon, Brandon lee had that je ne sais quoi (A certain something) like his father before him Brandon's screen persona shone through from all the few films he was in none projected this more than his final film ''The Crow'. Heres a list of all his films and trailers for your viewing pleasure, Why not dig out one today and celebrate a life that was taken to soon. Legacy of Rage - An Herioc Bloodshed title Directed by Ronny Yu which also stars Michael Wong and for all you Bruce Lee fans has a cameo by the one and only Bolo Yeung. Laser Mission - Brandon Lee stars with Ernest Borgnine in this low budget take on James Bond. Rapid Fire - Brandon Lee in one of his finest action flicks with Powers Boothe as a man who witnesses a murder. Brandon was one of the finest actors of all time! Considering he was so young, you’d have thought he’d have done it for 40years+. Nothing was beyond Brandon’s skill, he had charisma and charm by the bucket loads, and to top it off-had time for everyone and ALL of his fans! Nothing was too much trouble, Brandon was one of those rare people, even at such a young age, would go that extra mile if it meant he would be helping someone. Thank you for stopping by, I totally agree his passing was before his time, but the time he had he shone.